Welcome to another episode of #ThatBusinessShow with Jamie Meloni! Happy friday, and today we had a great lineup. Remember that the show airs live on #1250whnz at 8am, and can also be found on http://www.tampabayradio.com along with all of our guests and other shows! Today we welcomed Jason Woody, President and CEO of Lions Eye Institute, He and his dedicated team have helped bring the “gift of sight” to over 65,000 men, women and children around the world His true commitment to help those blind or visually has been demonstrated by his over 25 year tenure with the Lions Eye Institute. 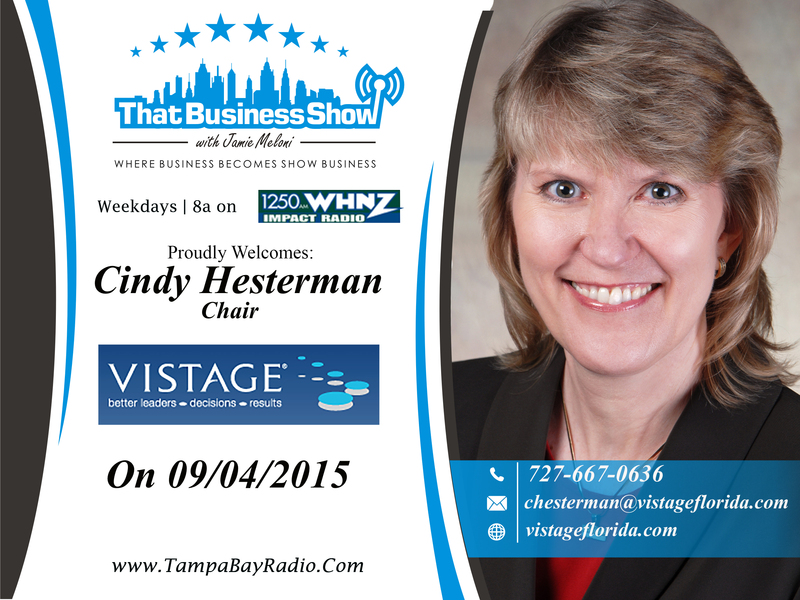 Also with us on the show was Cindy Hesterman, Chair of Vistage Florida. Cindy became a Vistage Chair in 2002 so she could focus her career on helping executives become better leaders, make better decisions and achieve better results. We had great content today, and you can listen to the show live every weekday at 8am or at http://www.tampabayradio.com, or catch the live stream on YouTube, at http://www.youtube.com/jamiemeloni. 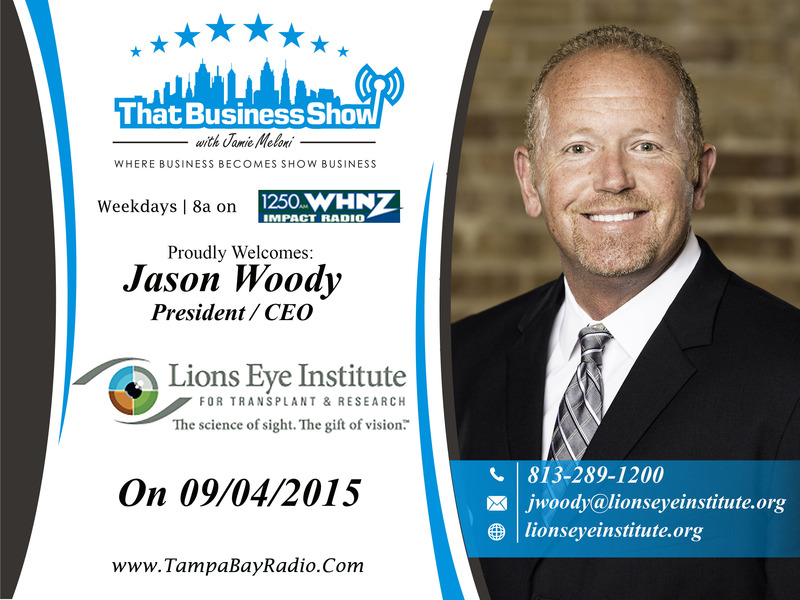 On our first segment was Jason Woody, President and CEO of Lions Eye Institute. Since 1973 the Lions Eye Institute for Transplant & Research has brought the “Gift of Sight” to over 52,000 men, women and children around the world and provided over 30,000 eyes for invaluable research. The Lions Eye Institute has been ranked the single largest eye bank in the world for the past decade. Jason and I discussed the need for organ donors, and what Lions Eye has done for the world as a non profit company. Jason gave us a bit of the history of Lions Eye, beginning in 1917 with the inspiration of Hellen Keller. Now the company is global, and has the largest facilities for ocular studies. By the year 2020, over 43 million Americans will develop a blinding eye disease. Jason informed our listeners eye disease is guaranteed…if you live long enough you will develop an eye disease. Great content here on #ThatbusinessShow with Jamie Meloni! You can find out more about Lions Eye Institute at http://www.lionseyeinstitute.org. This entry was posted in Articles, Entrepreneurship and Business and tagged business, entrepreneur, health and wellness, research, show business. Bookmark the permalink. I’m really enjoying the design and layout off your website.